Naval Construction Battalion Center (NCBC) Gulfport is located in Harrison County in the city of Gulfport, Mississippi on the Gulf of Mexico. Gulfport, along with Biloxi, Pascagoula, Ocean Springs, and Bay St. Louis, is one of the cities that line the beachfront of Mississippi. New Orleans, Louisiana is only 90 miles west. NCBC functions as a support for operating units of the Naval Construction Force. Specifically, it supports Naval Mobile Construction Battalions ONE, SEVEN, SEVENTY-FOUR, and ONE THIRTY-THREE, TWENTIETH Naval Construction Regiment, the Naval Construction Training Center, and other smaller tenant activities. The mission is to prepare for and support all facets of the mobilization of construction forces, including reserve units. The Center is also responsible for preservation and storage of war reserves including construction equipment and materials. Gulfport, along with Biloxi, Pascagoula, Ocean Springs and Bay St. Louis, is one of the cities that line the beachfront of Mississippi. New Orleans, Louisiana is only 90 miles west. The closest commercial airport is the Gulfport-Biloxi Regional Airport. Airlines servicing Gulport-Biloxi Airport include Airtran, Delta, Continental, and Northwest. Taxi Cabs do service NCBC Gulfport from the airport and will cost an average of $15-$20. There is also an airport in New Orleans approximately one hour west of NCBC, Gulfport. Most major carriers including American, United, and Southwest Airlines serve New Orleans Airport (MSY). Coastline Transportation is a local company providing shuttle transportation to NCBC, Gulfport, from both Gulfport-Biloxi and New Orleans Airports. Mobile, AL also hosts a regional airport and is approximately 1 hour east of NCBC, Gulfport. Please contact your sponsor and advise them of your estimated arrival time and flight information if applicable prior to your arrival at NCBC, Gulfport. Driving Directions: Take the I-10 Exit 34A to HWY 49 South towards HWY 90 (the beach) turn right on HWY 90. Go to the third traffic light (Broad Ave) turn right on Broad. This road (Broad Ave.) dead ends at the main gate. The Visitor and Pass office is located at the Broad Avenue gate. From the Airport: Take HWY 49 South until the Naval Construction Battalion road sign is seen. Take a right on Pass Road and this will lead you to Gate #2. If you need a visitor pass you must go to Broad Avenue gate. See the above directions. Major Units at the NCBC include the Construction Battalion Center, 20th Naval Construction Regiment, and the Reserve Naval Construction Force. The Center serves 4,451 active duty personnel and their families and 6,400 retirees and their families. There are also 780 DoD Civilians. Within walking distance from the: Navy Exchange, Youth Activities Center, Commissary, Gas Station, Mini Mart, Package Store (Gas Station, Package Store, and Mini Mart are combined), Child Development Center, Beauty Shop, Barber Shop, Subways, McDonalds, Colmer Dining Facility, Fleet and Family Support Center, and Family Housing Center. Hours: Monday-Sunday 6:00 a.m. - 11:00 p.m.
Stethem Memorial Navy Lodge is an 80-unit Lodge, representing the latest in motel design. Rooms are specially equipped for the handicapped. Most units contain a complete kitchenette, cable television, DVD. Cribs roll-away beds and high chairs are available upon request. Free Wireless Internet is also available in all rooms. Unaccompanied personnel reporting to NCBC Gulfport have a number of excellent Housing choices. Unaccompanied Housing (UH) is conveniently located near the center of the base on Sixth Street allowing immediate access to the main dining facility, chapel, gym, and fitness center. It's just a short walk away from the Navy Exchange, commissary, McDonald's and the MWR Liberty Center. Buildings 306, 309, 316 and 318 provides permanent party accommodations for eligible unaccompanied personnel. 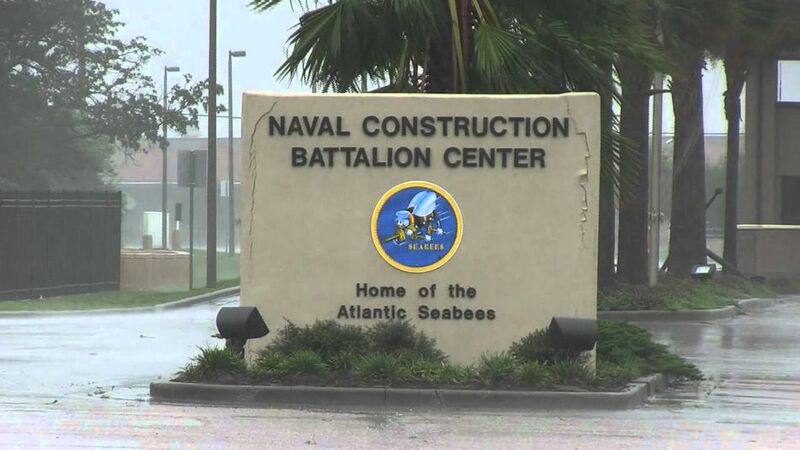 Buildings 315, 317 and 460 provides accommodations for personnel temporarily assigned duty under instruction to Naval Construction Training Center. Accommodations are one or two persons to a room based on pay grade and square footage. Building 313, Navy Gateway Inns and Suites, serves as the check-in point for all permanent party and dormitory buildings and is manned 24 hours a day. Linen is provided at check-in. As an added convenience to residents, there are lounges equipped with televisions and vending machines. Cable television, high-speed internet as well as landline phone service is available to all permanent party residents at the residents' expense. NCBC Gulfport has partnered with Balfour Beatty Communities to offer you and your family outstanding housing choices. There are 601 privatized homes in eight neighborhoods: Ladd Circle, Magnolia Place, Magnolia II, Nickel Creek in Slidell, La, Northpointe Preserve, Pinewood, The Woodlands, and Woodlands II. All of the homes are recently constructed or renovated. We have a mixture of single family and townhomes with two, three and four bedrooms. The typical wait for a home is approximately 0 to 6 months however it constantly changes and to get the most current projection of housing availability you should contact the HSC. There are currently no DODDS School on base. There are several public and private kindergartens, elementary, middle, high and vocational schools on the Gulf Coast. 1. A Mississippi Compliance Form-take your child's shot record to the Harrison County Health Department (228863-1036), a community physician, or to the CBC Branch Medical Clinic Immunizations Section (228-871-2810, then press 5) to obtain a compliance form. 2. Child's social security card. 3. Certified copy of child's birth certificate. 4. Two proofs of residency-acceptable proof-deed, lease agreement, parent/guardian drivers license with Mississippi address, utility bills. 5. If you are entering school mid-year, we recommend you provide samples of your child's work from your most recent school. Also, report cards, progress reports, current IEP, withdrawal documentation from previous school, and standardized test scores if possible. Contact the school's administration office to confirm what documents are needed for registration. Students transferring from a non-accredited school, or from home-school into Public School must take the appropriate placement tests as determined by school officials. Age requirements for Mississippi Public schools by State Law are: Kindergarten -Child must be 5 years old prior to 1 September and First Grade - Child must be 6 years old prior to 1 September. Children's shot records must be transferred to a MISSISSIPPI FORM 5 before the child can begin school. This can be done at the base Medical Clinic's immunization clinic. Bring the child's current shot record and medical records with you to accomplish the Form 5. State Law requires that if you move out of a school district and you elect to keep your children in the previous district, then you must pay tuition. Gulfport Child Development Care includes the Child Development Center (CDC), Home Program (CDH) and School Age Care Program (SAC). All programs are inspected by CNIC yearly and must maintain DoD certification to operate. The CDC offers child care services for children aged 6 weeks through 5 years old, including full-time, hourly drop-in (based on available space) and a Pre-Kindergarten program. The Child Development Home program consists of certified providers who provide child care services for children in their own home. The care is offered to children aged 6 weeks through 12 years old. The School Age Care Program provides care before and after school, transportation to several schools and back to the center for children ages kindergarten through 12 years old. The Youth Activities Center has a complete schedule of summer, spring break, and winter break programs for children attending kindergarten through age 12 years. The CDC has a capacity of 285 children and CHD providers number from 12 to 20 on average. There is only one SAC program on the base. The CDC is open 6 am until 5:30 pm, Monday through Friday, and offers Full Day, Part Day, Preschool Part Day, School Age Hourly Care and Special Needs Care. Proper information required about special needs and approval required for After/Before school programs on installation. All fees are according to total family income and a current Leave and Earning Statement (LES) and payroll data must be provided. Fees include lunch and programming. There is a $5 discount for more than one child. Also, there is a fee of $3 per hour per child for drop-ins (as space is available). Hourly care is strictly based on space available and parents can call up to a week in advance to seek space. Late fees are assessed at $25 per child for every 30 minutes you are late picking up your child. First Priority Care is given to children of single parents and dual military. The Branch Medical clinic provides , most routine services for Active Duty service members and their families. The Navy Branch Health Clinic is located at 5501 Marvin Shields Blvd. and can be reached by telephone at 228-871-2810 or 2811. The family practice provides continuing and comprehensive health care for active duty family members and retirees. Medical care in family practice is for ages 2 months through 64 years, both sexes and most medical conditions. Currently BMC, Gulfport does not provide services to Senior Prime and OB patients. The closest medical facility supporting Senior Prime and OB patients is Keesler Medical Center in Biloxi, Ms. The CBC Gulfport Branch Dental Clinic is co-located with the Naval Hospital Branch Medical Clinic in Building 295 on Marvin Shields Boulevard. The clinic provides routine dental care for active duty personnel and extremely limited, space available, care for other eligible beneficiaries. The Branch Dental Clinic's hours of operation are 6:30 a.m. to 3:00 p.m., Monday-Friday, and the phone number is 871-2605/2606. Sick call and recall visits are conducted by appointment and on a walk-in basis from 6:45 to 9:30 a.m., Monday-Friday.